This project looks at the ways in which digital archive metadata can contribute to the visibility of human rights violations. 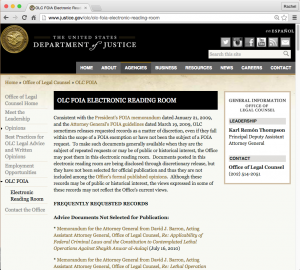 By looking at governmental and nongovernmental digital repositories of U.S. government documents, with a focus on documents showing evidence of human rights violations under the George W. Bush administration, I hope to better understand how online archives and their interpretation of documents through digital representations, metadata choices, and search mechanisms make information on state violence available to the public and potentially facilitate different understandings of history and accountability. The project has three related components/online exhibitions. The first involves creating a visualization of how a few key government documents related to the U.S. “War on Terror” have been incorporated into online archives—using digital storytelling to trace their course through these information systems and their representation in the user interface. Through this I explore the ways in which evidence of human rights abuses by the state is presented and circulated in digital form, including contrasting the representations in different governmental and non-governmental repositories. The second exhibition, titled “The Materiality of Redaction/Artifacts of Non-Information,” examines different forms of redaction and withdrawal evident in documents from these collections, ultimately working toward recognition of ways redactions/withdrawals signal “the presence of absence” of information. 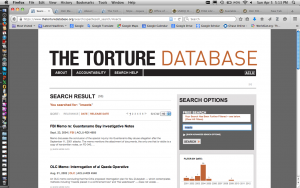 The third component of the project, “Visualizing the ACLU Torture Database,” is the exploration of a specific Application Programming Interface (API) tool developed by the American Civil Liberties Union (ACLU) for their Torture Database project that allows the public to pull data directly from their online database of documents related to possible evidence of torture (www.thetorturedatabase.org/api). I explore a range of uses for this tool to demonstrate how the third-party development of metadata and digital tools relating to government documents can allow for different access to information, as well as its interpretation and representation. 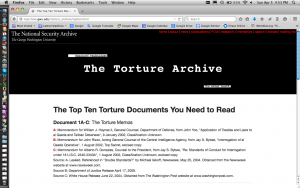 This project is part of my broader dissertation research into the afterlives of U.S. government documents from the 2001-2009 period, which takes an interdisciplinary approach, including this digital analysis alongside ethnography at physical archives, interviews with archivists and indexers, and critical discourse analysis. Ultimately, I seek to understand ways in which these information systems can potentially impact dialogues about memory, history, and the politics of accountability in a society shaped by a state discourse of terror threat. The database structure, the search engine, the metadata category, and the keyword tag that attach to an archival object of past material become a part of our comprehension of the items in the archive themselves and shape the conditions of possibility for knowledge of the past. When such an archive consists of government documents—particularly those that show evidence of human rights violations by the state—the technologies through which we access and interpret those documents become a crucial site of the struggle for our understanding of history.